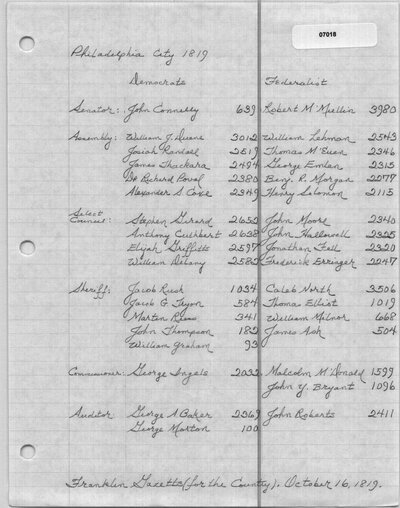 The Union and the American Daily Advertiser list 167 votes for Isaac Horn and 69 votes for John Thum. The Democratic Press lists 5406 votes for George Ingels, 2766 for Malcolm MacDonald, 2071 for John Y. Bryant, 182 for Isaac Horn, 123 for John Geyer, 123 for George Summers, 59 for Tyberius J. Bryant, and 71 for John Thum. The Union lists 43 votes for Isaac Horn in the city of Philadelphia, though the ward totals given add up to 53 votes. The Intelligencer, and Weekly Advertiser (Lancaster, PA), the American Daily Advertiser and the Democratic Press list 44 votes for Isaac Horn. The Democratic Press lists no votes for Isaac Horn. The Democratic Press lists 1 vote for Isaac Horn. The Democratic Press lists 11 votes for Isaac Horn. The Democratic Press lists 29 votes for Isaac Horn. The Democratic Press lists 2 votes for Isaac Horn. The township votes for Tyberius J. Bryant as listed here add up to 31 votes, though several newspapers list Bryant's official vote total as 78. Similarly, township votes for John Thum add up to 59 votes, but official returns given him 64 votes total. It appears that Bryant's and Thum's votes in several townships were not reported in newspapers listing votes by township. 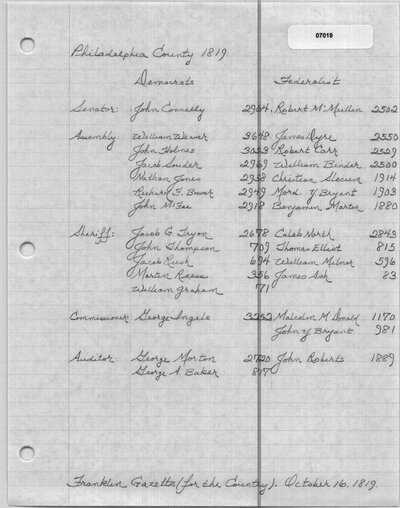 The Intelligencer, and Weekly Advertiser (Lancaster, PA) lists 3374 votes for George Ingels, 1167 for Maclcolm MacDonald, 975 for John Y. Bryant, 138 for Isaac Horn, 70 for John Geyer, 66 for John Thum, and 50 for Tyberius J. Bryant. 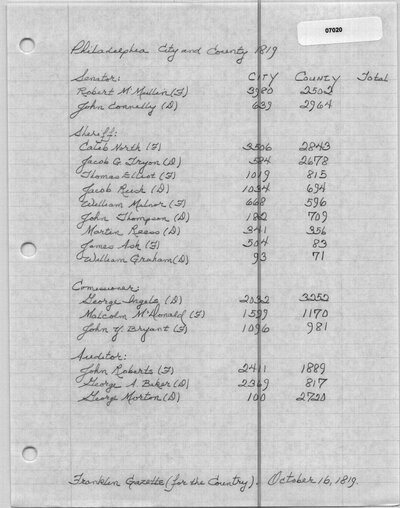 The Democratic Press lists 3374 votes for George Ingels, 1164 for Maclcolm MacDonald, 975 for John Y. Bryant, 138 for Isaac Horn, 70 for John Geyer, 66 for John Thum, and 50 for Tyberius J. Bryant. The American Daily Advertiser and the Union list 78 votes for Tyberius J. Bryant, though the township votes given add up to 31. The Democratic Press (Philadelphia, PA). October 13, 1819. Franklin Gazette (Philadelphia, PA). October 13, 1819. Poulson's American Daily Advertiser (Philadelphia, PA). October 14, 1819. The Union. United States Gazette and True American (Philadelphia, PA). October 14, 1819. The Democratic Press (Philadelphia, PA). October 16, 1819. Franklin Gazette (For the Country) (Philadelphia, PA). October 16, 1819. Relf's Philadelphia Gazette, and Daily Advertiser (Philadelphia, PA). October 18, 1819. The Intelligencer, and Weekly Advertiser (Lancaster, PA). October 23, 1819.